Sazon Goya - Inside this box you'll find what good cooks have always dreamed of, an absolutely fool proof way to make everything taste not just good, or even great, but sensational - every time. It's Sazon Goya, a special mix of seasonings from Goya. A little magic in little foil packets. Just cook the way you always cook, the same recipes, the same seasoning, changing nothing. 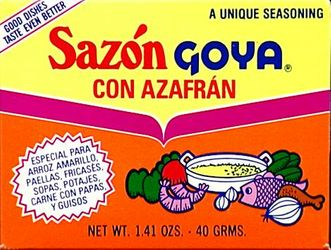 Except: for every 4 people your recipe serves, just add one packet of Sazon Goya. Two packets for a dish for 8. You'll wonder how you ever did without it. Specially for Yellow Rice, paellas, fricassees, casseroles, stews, soups and meat with potatoes. Sazon Goya will add more flavor to your food. If it is Goya, it has to be good! Ingredients: monosodium glutamate, salt, dehydrated garlic, cumin, yellow 5, tricalcium phosphate (anti-caking agent), annato (color), mexican saffron, turmeric (color), Red 40. Sazon Goya - Dentro de esta caja encontrara lo que los cocineros siempre han sonado, una una manera absolutamente infalible para hacer que todo, no solo lo bueno sepa bueno, o incluso estupendamente, pero sensacional - cada vez. Es Sazon Goya, una mezcla especial de condimentos de Goya. Un sobrecito de este condimento especial para carnes, aves, vegetales, frijoles y guisos, le dara a dichos platos un exquisito sabor y un precioso color. Anada el contenido completo de un sobrecito al agua (o caldo) con que prepare estos platos y condimentelos como usted siempre acostumbra para que toda la familia quede encantada. Pongale mas sabor a sus platillos con Sazon Goya. Especial para Arroz Amarillo, paellas, fricases, sopas, potajes, Carne con papas, y guisos. Disfrute! Si es Goya, tiene que ser bueno! Ingredientes: glutamato monosodico, Sal, ajo deshidratado, comino, amarillo 5, fosfato tricalcico (antiaglutinante), achiote (color), azafran mexicano, turmeric (color), Rojo 40. I love this, now I got my sister hooked on using this on black beans and on rice, taste so much better! Used in my chili recipe---was delicious!!!! Have never used this product but when my chili recipe called for this seasoning I was delighted to get it and use in my recipe---was very tastey. Will use it for other recipes--thank you for sending this to me!!!! ProsLove this product--one of my favorites. ConsCan';t think of anything bad--love it. Unfortunately no store in my region carries this type of Sazon, so I am forced to order it online and it's the best one for the saffron flavor I have ever tried. Please do not stop making or carrying it.